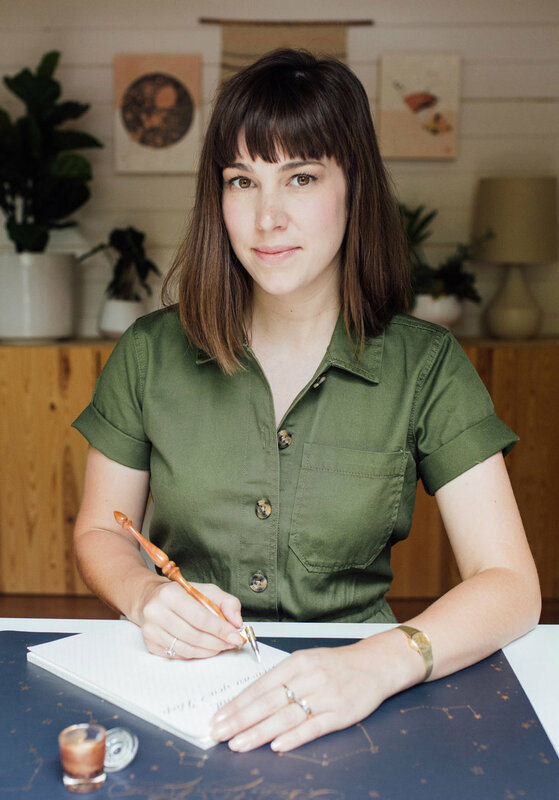 Antiquaria, a stationery studio based in Austin, Texas, is extremely excited to announce their debut Online Calligraphy Class — Script Design from Traditional to Modern — taught by their own expert calligrapher, Bailey Amon Rivera. The course is open for registration through Acorn Arts! This class has been a long time in the making and will be an incredibly awesome, fun learning opportunity for letter lovers everywhere! Script Design from Traditional to Modern is a four-week, online workshop with Bailey Amon Rivera. Classes will run for four consecutive Wednesdays in September, 2017. The aim is to take your script to another level with a focused course in letterform variations, word formations, and flourishing. We dive into the process used to create different styles, whether they're traditional, modern or somewhere in between. By focusing first on the "nuts and bolts" of letter construction and traditional letterform variations, we offer students of all levels a unique opportunity to both train their skills and develop individual variety at the same time. Creating your own lettering style is fun and easy when it's based on the foundation of traditional letterforms. As a calligrapher and stationery designer, Bailey has made a name for herself over the years with her unique and varied calligraphy styles. Besides being fun to experiment with and design new styles, this process has been crucial to developing her business and making her work stand apart from other lettering artists. This class is well suited for all calligraphy enthusiasts from complete novice to the more experienced and professional penman. The course material will start with the basics so that everyone can participate and learn together, no prior experience necessary. If you've been feeling stuck in your practice and want to brush up on your skills, or if you need new styles for your products or clients, this is the class for you. Classes will run for four consecutive Wednesdays in September, 2017: September 6, September 13, September 20, and September 27. New classes are posted once per week but you do NOT need to be online at that time. The videos may be watched at whatever time is convenient for you! Each Wednesday there will be new worksheets available for you to download with an instructional video. The Classroom Forum provides a wonderful place to share your designs with the other students and it is always such fun to take the class with students from around the globe. There is no homework for this class, but a project will be suggested each week. Antiquaria was officially born in August of 2010, but the adventure began a year earlier when Emma James and Bailey Amon met in the Austin, Texas, stationery store where Emma was designing invitations. Bailey walked into the store one day with her calligraphy portfolio and the two immediately hit it off...we’re talking instant mutual admiration society here. A couple of months later, Emma hired Bailey to do the calligraphy for her beautiful wedding invitations, and the rest was history. With their masterful use of calligraphy, hand lettering, hand-drawn illustration, vintage etching, watercolor, and typography, the Antiquaria design philosophy and product line embodies a vintage-modern design aesthetic. Antiquaria designs are meant to be approachable — not fussy or over-the-top. At Antiquaria, we believe design should feel natural, like it’s meant to be there, like it’s always been there. Above all, our designs should make you happy. Our extensive product line of greeting cards, gift wrap and gift items can be found in retail stores worldwide. Since starting her calligraphy practice in 2009, Bailey Amon Rivera has extensively studied many different calligraphy styles, both pointed pen and broad edge. She has trained with some of the most renowned calligraphers, including, Master Penman Harvest Crittenden, Master Penman Jake Weidmann, Master Penman Rosemary Buczek, Michael Ward, Dennis Brown, Sharon Zeugin, Yves Leterme, as well as many others. Because of the diversity of her training, and her continuous study of traditional script calligraphy and penmanship, Bailey's professional lettering work is distinctive and unique. Her clients include Paper Source, Anthropologie, Smithsonian Art Museum, and hundreds more. Bailey is also co-founder of Antiquaria, a high end stationery company and design studio, opened in 2010. Through her work with the company, she is able to design lettering of varying styles for their popular line of greeting cards and notebooks sold in stores worldwide. Whether using traditional pointed pen, hand lettering (also known as drawn lettering) or brush lettering, her personal style shines through in each project.